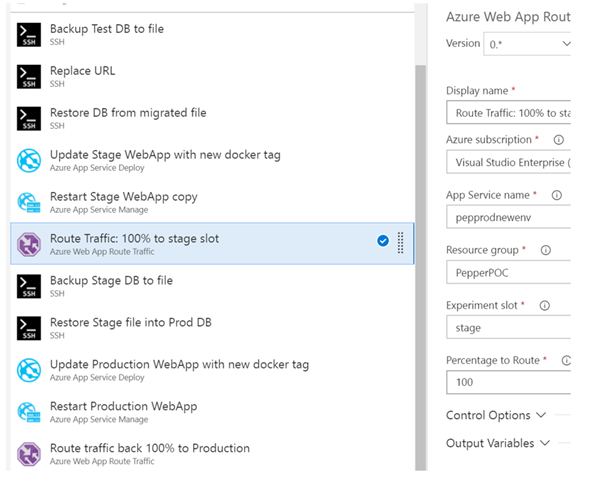 This post is the second part of two blog posts describing how to setup a CI/CD pipeline using Visual Studio Team Services (VSTS) for deploying a Dockerized custom WordPress website working with Azure WebApp for Containers and Azure Database for MySQL. In Deploying WordPress application using Visual Studio Team Services and Azure - part 1 we described how to build a Continuous Integration (CI) process using VSTS, while in this part we are going to focus on the Continuous Delivery (CD) part by using the VSTS Release management. MySQL client installed on Azure Virtual Machine (apt-get install mysql-client-5.7). First, we need to create a new empty release definition, go to releases, click on the + icon and choose create release definition, select empty process as the template. After clicking on Add, click on the trigger icon under the Artifacts section (step 2), a right blade will be shown, choose to enable the continuous deployment trigger. We need to move to configure the environments section, click on pre-deployment conditions icon (step 3), select After release trigger and close the right blade. Next step is adding tasks to the development pipeline, either click on the link (step 4) or click on tasks. It’s possible to use a more secure solution for storing sensitive values, read more about using Azure KeyVault to store sensitive values and use them in VSTS. Before returning to the tasks tab, we need to add a new SSH endpoint (Settings/Services/New Service Endpoint/SSH). Fill your Azure Virtual Machine details. Now, let’s go back to the tasks tab and start editing the tasks. We have completed building the development CD pipeline. Go back to pipeline tab, highlight development environment and choose to clone the environment (step 5), call the new environment test. As Pre-deployment conditions of test environment (step 6), select after environment trigger, enable the pre-deployment approvals option, choose a member of your team as a approver to initiate the deployment process for test environment. After closing the blade, click on the link below to view environment tasks (step 7). The tasks tab will be presented, no need to update the first three SSH tasks. The 4th task – update the App Service name to the correct App Service for test environment. The 5th task – update again the App Service name. Go to variables tab, filter according to test scope and set the variables values to test environment. We have now completed building the test CD pipeline. Learn more about the implementation option that can create task groups and use it between different environments. Our goal is to have a production rollout without any downtime to achieve that we will use the slot mechanism and routing capabilities that Azure App Services are offering. To create the production environment, repeat the same steps for creating the test environment (steps 8, 9 and 10). Go to the variables tab, filter according to production scope and set the values to production environment. Set the value of $(mysqldestdb) to stage DB. In addition, add a new variable $(mysqlproddb) and set the value to production DB. Go back to tasks tab, update the App Service name for the 4th and 5th tasks, this time check the deploy to slot option and choose ‘staging’ slot which we created for the production App Service. In this series of two blog posts, I hope you had a chance to experiment how easy is to get started with building modernize DevOps processes by adopting Docker, start using Visual Studio Team Services (VSTS) as your CI/CD tool and Azure as the cloud provider. This kind of modernization can be the first step towards deployment transformation of any organization.